Men today wear fewer and fewer suits in the office, and I can understand that this could make bespoke tailoring seem less relevant. But the value is just as great in having an odd jacket made and wearing it with more casual trousers. You get the benefits of the Anderson & Sheppard comfort, great fit and great quality, but in an everyday jacket that you can wear in a variety of situations. Right now, by far the most popular material for odd jackets is linen. Understandable really, given the weather, but it is also a great summer choice and a material that I personally love. It wears very well, can just be thrown on every day and ages very well. Men tend to order it in heavier weights, in order to avoid as much wrinkling as possible, which I would recommend. Thirteen ounce, for example, rather than 10. It gives the jacket a little bit of gravitas. If all you want is lightness, then have a 10-ounce jacket and get it half lined. Cotton is also very light and a nice alternative for summer but I find it’s hard to wear – it’s very unforgiving, you constantly feel you’re battling against it, plus it doesn’t last that well. In colder months, tweed is the most popular. Men love their tweeds, particularly the big checks (not that the cutters like working with those much!) and the most commonly ordered colours are brown and green. But there has also been a trend recently towards tweeds in less countrified colours, such as blue and grey. That’s probably in line with more men wearing them in the city. 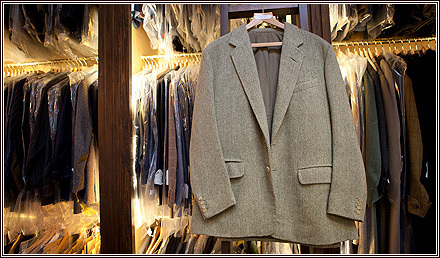 Tweeds can be in any colour and any pattern – a light grey herringbone or Donegal, for example. The weights have become lighter for tweeds as well, enabling them to be worn longer through the year. Once men like tweed and get into it, they want to wear it for as long as possible.